The Zelda series is home to some radically different styles of storytelling, gameplay, and visual design. But if the entire Zelda franchise could be distilled to one set of elements, one preferred tone and graphical style, which would it be? Should Zelda games continue to pursue whatever direction they have grounded themselves in from their inception, or should they move forward into bold new territory? The tone of the earliest Zelda games is hard to pin down. Dialog was sparse and nuanced graphical design was sparser. We know from other games available on the Nintendo Entertainment System that a predominantly cartoonish graphical style was possible; Super Mario Bros. 2 (American version) and 3 utilized it well, as did third-party titles like DuckTales and Mega Man. But perhaps due to their size, both Zelda titles offered comparably rudimentary character design, making up for it with sheer scope and vision. Likewise, the stories were sparse, outlined in manuals or other external sources. While we also know that it was possible to convey a great deal of atmosphere on the NES (see Shadowgate, Deja Vu), the most we can surmise about Hyrule is that it is a rich, old world, mostly unpopulated in the first game and heavily populated in the second. However, Miyamoto has made it clear in the past that the original Legend of Zelda was inspired in large part by his own experiences as a child in Kyoto. According to Gamespot, “His inspiration came from the fields, woods, and caves outside Kyoto that he had explored as a boy, and he has always tried to impart this sense of exploration and limitless wonder to players through his Zelda titles.” Judging from this story, which Miyamoto has told on countless occasions, it becomes quite clear what the original Legend of Zelda strives to achieve. At the very core of the Zelda franchise is a sense of childlike wonder, of freedom and exploration. Children are intrigued by the world around them because they are gradually familiarizing themselves with its intricacies and mysteries, and if one franchise boldly captures this attitude, it is The Legend of Zelda. This much is clear from the franchise’s 8-bit origins, a game that demands the player endlessly raid caves, bomb walls, and solve puzzles. The Legend of Zelda was the Indiana Jones of the gaming world, filled with mysteries and secrets. The most curious player will be duly rewarded with rupees, weapons, and heart containers; someone who simply rushes through the game without stopping to enjoy what it has to offer will gain much less. By now, we’re all used to this. The Zelda franchise wasn’t the first to capitalize on secrets (even Mario had warp zones and caves hidden under pipes), but it was one of the first successful ones in recent memory that was based entirely around this concept (Metroid, released around the same time, used a similar mechanic but arguably did not feel quite as expansive). It has since revolutionized the game industry. We all know the implications of exploration as a game mechanic; it’s self-explanatory, as basic and simplistic as it is filled with promise. But what does it teach us about the tone and style of the franchise as a whole? With the release of the Super Nintendo, exploration, visual style, and story became more prominent. The backstory in the first two titles was extraneous; in A Link to the Past, it was brought to the forefront through cut-scenes and dialog. The lore and sense of history manifested itself in the obviously cartoonish visuals as storytelling, gameplay, and tone became inseparable. Link’s Awakening took the franchise in a radically different direction, acting almost as a parody of its predecessors but preserving the core elements of exploration and adventure that had graced the first three titles. If you had asked a Zelda gamer what they thought of the franchise’s tone at this point in history, you might have gotten mixed responses. However, the fact remains that when Nintendo was really able to bring visual design to the fore with both the Super Nintendo and the Game Boy, there was one singular theme: whimsy. There’s a fair amount of humor in A Link to the Past. Link turned into a pink bunny when he entered the Dark World, for example, and enemies would run in place before falling down one of the countless bottomless pits. Humor was not particularly sparse and in contrast to other Super Nintendo games like Contra 3 and Final Fantasy IV, the world was filled with bold colors and large, round shapes. Not only was it heavily stylized, it was stylized with a sense of humor. Coupled with the sense of boundless exploration offered as early as the first game, this tone can easily be described as childlike. Indeed, Nintendo was directly appealing to a young demographic with these games. As epic as we may like to think the Zelda games are, they are grounded in a child’s experience of the world rather than in an adult’s perception of it. By the time Ocarina of Time hit store shelves, that was the identity Nintendo and Miyamoto had chosen to forge for this series, and it wasn’t going away any time soon. Oh yes, Ocarina of Time gave us our first glimpses of an “adult” Hyrule, and it was incredible. But the Zelda series hadn’t lost its innocence. Instead, Ocarina of Time capitalized on that innocence by bringing the theme of growing up to the fore. Its much hailed “darkness” did not exist in a vacuum; instead, we were brought characters who were more whimsical and filled with personality than ever before, and their antics were humorous throughout the game. Visiting Kokiri Forest, Lon Lon Ranch, or Kakariko Village as a child certainly helped to put later events into perspective. Exploration was still entertaining as well, and Nintendo made a special attempt to make the world seem large and impenetrable, especially next to child Link. Majora’s Mask, as hailed as it was for being “dark,” is much the same, but it actually feels much less realistic and much more whimsical. Characters are over-the-top, their situations often far removed from the real world. 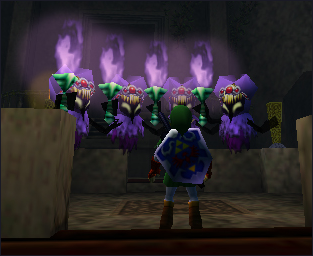 Indeed, Majora’s Mask was the first Zelda game to prominently feature aliens as a plot point, and the cow abduction scenes, however dire their consequences, were deliberately funny. Both of these games had an anime style that, while balanced with a certain degree of realism, emphasized caricature over picture-perfect character portraits. 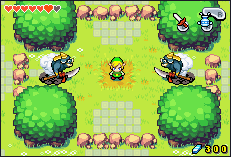 Subsequent Zelda games have also offered a similar atmosphere and tone. No one disputes that The Wind Waker is heavily animated and lighthearted. So were the Oracle games, The Minish Cap, Phantom Hourglass, and Spirit Tracks. Skyward Sword looks to follow these games in a similar vein. While some believe that the DS games, which follow directly from The Wind Waker’s style, are something of a new phenomenon, I think it is evident from the franchise’s origins and its consistent focus on caricature that it always was and it remains childlike. This is something to be proud of, not to shun. Some of the greatest fantasy literature and film is based on a similar atmosphere. The Star Wars films were originally made for children, while the Harry Potter series, originally written for children, has captured the hearts of adults as well. While many such series (including Star Wars, Harry Potter, and Lord of the Rings) strike out in a darker and more “adult” direction, this is not always the case (see The Chronicles of Narnia). The developers of the Zelda franchise have ably explored its darker side without, for the most part, forgetting what made the aesthetic so fun in the first place. There is one exception which should be noted. Twilight Princess, touted as “a love letter to Ocarina of Time fans,” had its share of whimsical moments, but overall tried very hard to be “dark” from the start. This was not accomplished by painting an Alice in Wonderland-style world like Majora’s Mask, but by washing everything in brown, muddying up textures, and limiting humor. Indeed, no Zelda game has taken itself quite so seriously as Twilight Princess, but in the process, I believe the game lost some of its charm. Instead of exploring Hyrule with a sense of wonder and astonishment like the Hero of Time, instead of finding himself in funny situations like the Hero of the Winds, Link in Twilight Princess seemed focused solely on his task. For all its realism, Twilight Princess seemed somewhat removed from the escapism that had made the Zelda series so much fun in the first place. Ultimately, however, Zelda is consistently escapist fantasy. When it is at its best, this tone and style allows for variety and a fresh experience with each new discovery. In an era of gaming in which realism is held high as a standard, Zelda’s cartoonish, whimsical, and childlike tone stands alone in the gaming industry. Instead of demanding “maturity,” Zelda fans should embrace this diversity, and insist that however innovative future Zelda titles are, they remain appropriately grounded in fantasy. With Skyward Sword, it looks like Nintendo has kept this in mind.